Can you believe another month has gone by since our last Plaid corporate office Lunch n Learn blog post? Time flies when you are having fun, right? And having fun is exactly what our corporate employees had at this month's Lunch n Learn event. As always we shared a delicious catered lunch, lots of laughter and then enjoyed class time experiencing yet another new Plaid product. This month's featured new products were the newest members to our Mod Podge family, Mod Melts and Molds, Collage Clay, Collage Drizzle Paint, and Podgeable Glitters! 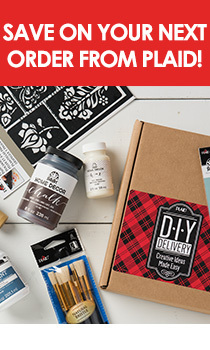 All of these new Mod Podge products are available at Michaels as well as plaidonline.com! Following crafting trends is fun and keeps you "in the know" as well as up-to-date with all the latest products! In following crafting trends, I am sure you have seen the HUGE craze of decoden-style crafting particularly on cell phone cases. If not, you may say, "What is decoden?" Decoden is the art of embedding small trinkets into whipped clay creating a decadent and whimsical item. Project surfaces vary from frames, box lids, lamp bases, and jars, to cell phone cases like what we used in this month's Lunch n Learn class! The trend of decoden crafting began in Japan and quickly traveled to the US! And now Plaid has developed and marketed Mod Podge Collage Clay a lightweight whipped clay that is primarily used in creating decoden style craft projects. continue filling until the silicone mold is full; allow to cool. It is as easy as that! I used the Milk Glass White Mod Melts for our class, however, you can experiment with the other melts available: Sea Glass Clear, Opaque Colors (Purple, Green, Blue and Red), Neon Colors (Green, Pink, Orange and Yellow), Metallics (Gold and Silver), and Glitters (Red, Green, Silver and Gold). TIP: Both the Milk Glass White and Sea Glass Clear can be used as is or may be decorated with most crafting products such as: paints, stains, Mod Podge Sheer Color, alcohol inks and even nail polish! Have fun experimenting and coming up with your own way to decorate your Mod Melt embellishments! Releasing the cooled embellishment from the Mod Mold is easy as the molds are not rigid. They are made of silicone and will easily bend. Look at how easy the heart embellishment "pops" out! Sometimes, however, when making an embellishment, you may accidentally overfill the mold. When cool, the excess will need to be trimmed. TIP: Trimming excess Mod Melt from an overfilled mold is easy to do. Simply snip the excess using fine point, sharp scissors or a craft knife. I designed an Ombre Mod Podge Collage Clay cell phone case using all the same sized heart embellishments laid out in rows. I chose to use two colors, Wicker White and Magenta. After laying out my pattern and determining how may rows of hearts I would need, I then painted each row of hearts just slightly darker in value from the previously painted row beginning at the top with Wicker White. TIP: If desired, take a moment to "pre-mix" the different values or shades before painting. This will enable you to paint each row quicker! Using a Mod Podge Spouncer, fill the spouncer by dabbing into the puddle of paint and then simply dab the paint onto the heart. Allow to dry; if desired, you may choose to paint a second application of color. I continued painting with the spouncer until all hearts were painted! The FUN continues! I decided Strawberry Pink Mod Podge Collage Clay was appropriate for this very "girly" cell phone case. Remember, it also is available in Vanilla White. Remove the cap, but save it -- don't throw it away. For this project, you will only use a small amount of the clay and after it is recapped, it will last for a long time and can be used for future projects. Mod Podge Collage Clay is packaged in a bag similar to an icing forcing bag along with three different tips and a cap. I chose to use the star tip as I LOVE the pattern it makes! Attach the tip after removing the cap. If you are a cake decorator, you will love this as it is the same as icing a cake! Force the whipped clay down to the decorator tip and then squeeze the bag while holding the tip straight up and down to the surface. Touch the surface, squeeze, release pressure and lift all in a quick motion. Create small little stars of Collage Clay across in rows over the entire back of the cell phone case. Remove the decorating tip and rinse the excess Collage Clay from the tip using cool water. For my "girly" styled cell phone case, I chose to accent with White Collage Drizzle Paint. It is easy to apply. Hold the bottle upside down and shake the paint down into the nozzle. Remove the cap and hold the bottle above the crafting surface, lightly squeeze and move your hand across the surface allowing the drizzle paint to fall. TIP: Notice that I placed a small section of waxed paper underneath my case. This will capture all the excess Collage Drizzle Paint as it overflows the sides. Every "girly" styled project needs bling and glitter right? Adding a touch of glitter is a perfect addition to my Collage Clay project. TIP: Mod Podge Podgeable Glitter is best used on its side; lightly squeeze the bottle. Small "pouffs" of glitter will fall onto your project rather than a heavy application landing all in one spot. Next, I began adding the painted heart Mod Mold embellishments. These are added and then pressed into place. Adding flat back gems are of course, optional. However, most decoden style projects do feature an element of bling as a small filler or accent. I chose to add a few. TIP: You noticed the order I used when layering my case ... Collage Clay, Collage Drizzle Paint, Podgeable Glitter and then Mod Mold embellishments. If you prefer, you can mix it up this way ... Collage Clay, Mod Mold embellishments, Collage Drizzle and then add the Podgeable Glitter. Like with most crafts, there is room for personal preference. Experiment and see the look your prefer. And here you have a Mod Podge Collage Clay Ombre painted heart cell phone case! Now you may ask me how long will this take to dry ... Mod Podge Collage Clay will begin to dry within the hour depending on the thickness applied and the humidity of your work area. It may take from 2 - 5 days to be totally cured (again depending on the application thickness and humidity). Let's take a quick look a second cell phone case that was detail painted. Using embellishments from the same Mod Podge Trinket mold, I chose food related embellishments and painted them using the same color palette, Wicker White, Apple Red, Lemon Custard, Vivid Orange, Bark Brown and Classic Green. I used Mod Podge Collage Clay Vanilla White and Collage Drizzle Paint - Brown in combination with Gold Podgeable Glitter! And here is a look at the two completed Mod Podge Collage Clay cell phone cases! This craft can be enjoyed by crafters of all ages, however, I believe our "tween" crafters will LOVE it the most! TIP: And keep in mind, this can be designed for DIY home projects such as photo and mirror frames or box lids, etc. Like I said earlier, experiment, add small household trinkets, buttons, gems, jewelry beads, the sky is the limit. Use your imagination and have fun with Mod Podge Collage Clay!